Well, so much for my “promise” of blogging more often. Three weeks?? That has got to be a record. My poor blog is as neglected and forgotten as this old house. (Autumn reflections in windows.) No, nothing is wrong — just living life away from the keyboard. I haven’t even been around to read or comment on anyone else’s blogs either, so for that I apologize. That having been said, this will be a catch-up post and longish. I will be by to visit your blogs soon! We’ve been having a series of clipper systems coming down from the North and snowing on us with frigid temperatures. Last Tuesday we got snow —about 4 inches worth — while the city got about a foot. On Saturday we were supposed to get “a coating to an inch” and ended up with 3 inches. And just yesterday we had an unpredicted little snow that coated all the surfaces we had just cleaned the day before. We’ve had so many gray days that it’s hard to count them all. We saw blue sky yesterday morning for an hour or so and it was a welcome sight. With the temperatures not getting above freezing for the past week we’ve had the wood fire going all day. It keeps that part of the house so toasty warm! Today is the first day above freezing in a while but tonight it is supposed to plummet again to the single digits. The dogs like it when I don’t clear all the snow off the decks and leave them something to lay on. Hailey turned ten years old on Friday. A grand old age for her breed. She does not like the weather we’ve been having other than to lay in her snow pile. I attempted to take them for a walk last week when it warmed up to 20 degrees but there was still patchy ice on our road. She kept pitifully picking her paws up and holding them in the air as if to say “mom, it’s too cold on my poor little pads!” So I brought her back home and went with only Bella who didn’t seem to notice. I’ve never seen one of our dogs ever do that before. If was almost funny if you didn’t think she was in some kind of discomfort. She and Bella have become closer since we lost Alex. She was even playing in the snow with Bella the other day on the deck like a puppy. They have also taken to lying next to each other like siamese twins. It’s really sweet. I have been somehow keeping myself busy even though I stay home a lot. I have been knitting this Katniss-inspired Cowl (from the Catching Fire, the second of the Hunger Games movies) and I’m super excited how easy it was and how well it turned out. I tried to get a pic of me wearing it and it was harder than you think it would be. (Getting the photo, I mean. Self portraits are not my forte.) I’m now making a second one for my sister. And yes, it was one sleeve and the other side just drapes over the shoulder. For Christmas I gave us a trail camera. I mostly bought it for the cabin so we could catch those animal visitors that we never get to see, but I also thought it might be fun here as well. It takes photos both in daylight and at night by infrared. We set it up the night after it snowed and here were a few visitors we caught. It’s very cool because each pic has a read out of the temperature, the date and time that it was taken. I think the photos are pretty good quality! It was fairly inexpensive so I’m sure we’ll have more than one set up in different areas at the cabin. In this mash-up of topics I just had to include a photo of our lunch yesterday: Roasted Pears with Honey Mustard Glaze, Brie & Pistachios. We’ve had this several times and each time it seems to get better. We serve it on a bed of arugula with high-quality balsamic vinegar splashed on top. We are also moving forward with retirement plans, which are still two years in the future. We are excited about the most recent development for the winter months if we decide the cabin is just too “out there” for spending the winter in, but I don’t want to talk about it just yet on the blog for some personal reasons. Let’s just say it makes perfect sense for us. I am also forming a blog post in my head about the sense of belonging. It just has not jelled completely yet. We are also thinking about getting one of these cute little things. We have always had in the back of our mind to get a motorhome and travel some in retirement, but after going to an RV show recently and playing with all the numbers and the amount of times we’d be traveling, we came to the conclusion that it didn’t make sense money-wise. To get a T@B, however, would fill the need to go “glamping” and it’s priced reasonably enough to justify its purchase. We still need to see one in person since we are fairly certain Rick won’t be able to stand up to cook if we get the one with the inside kitchen, so a close-by RV show in February should decide that issue. So, that’s my life lately summed up in a clamshell (or teardrop), and if you didn’t follow the link you won’t get the inside joke. Happy Birthday, Hailey! That’s great that she and Bella are becoming closer. Love the trail camera pics. The fox is definitely still around and the deer pics are cool too. You’ve definitely peeked my interest about your retirement plans. The teardrop looks interesting! You’ll have to let me know what it looks like inside after you go to the RV show! Well hello, Stranger! I wondered where you’d gone. I love the T@B trailer! Very cute. It’s like the “tiny houses” that have become the rage in certain design circles. The cowl is nice too. And that trail camera—I LOVE that. I had no idea such things were available other than to researchers. I ought to get one for my mom so she can see what meanders through her back yard at night. Does it only take photos when there’s movement? How many photos do you wind up with in a given night? Glad to see what you’re up to! and I based it on price and its reviews. I only looked at cameras that had a four star rating or higher. During the day it takes photos based on movement and at night it goes by heat source. Pretty cool. The number of photos depends on how much activity it finds. It will take 4 photos consecutively when it first senses something, 10 seconds apart. Then it waits until the next movement or heat source. I think between the deer and the fox we had around 30 photos or so? I should get one of those cameras to see what and who is under my house! I think I have TWO possums under there now. Glad to see all is well. Love the cowl, your lunch, the camper, and the camera. I have been thinking for a few years how fun one of those would be at the cabin as well. I LOVE the pic of you with the cowl. You look so effortlessly cool, especially your hair. Go curly girl! 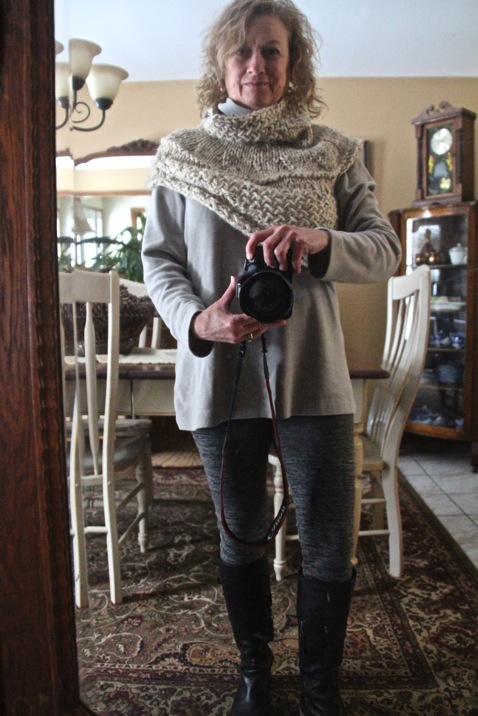 Of course I am coveting the cowl…. Not to mention wanting a little teardrop of my own. That’s my idea of camping! Big sis, not taken on the best of hair days, so oh well. Glad you are coveting the cowl because yours is halfway there! Are you sure you could “camp”?